Enda Kenny has opted to start vouching for his parliamentary expenses – and is therefore entitled to higher monthly payments. Enda Kenny's move means his expenses are subject to audit - but that he also receives an extra €8,000 per year. TAOISEACH ENDA KENNY has switched to a vouched form of parliamentary expenses, meaning his claims for running his local office in Mayo are now subject to audit – but at a cost to the public. Records published by the Houses of the Oireachtas show that Kenny has stopped claiming his parliamentary allowances on an unvouched basis, as had been highlighted by TheJournal.ie in February. The move means any bills used by Kenny to cover the costs of running his parliamentary offices in Dublin and Mayo, such as advertising and cleaning, must be kept on file for five years and can be subject to audit by the Oireachtas at any point in that time. The move does mean, however, that Kenny is entitled to a higher monthly allowance than those who opt against subjecting themselves to an audit – and will be entitled to receive an extra €8,000 per year as a result. Overall, however, there is no extra cost to the taxpayer – as education minister Ruairí Quinn has switched from the vouched system back to the unvouched one, saving the same amount per year. All members of the Oireachtas are given the opportunity at the beginning of each year to decide whether they will opt for the vouched or unvouched allowances model. A government spokesperson said Kenny had registered to claim the unvouched allowance in January 2011 prior to becoming Taoiseach, and that he had registered for the vouched allowance in January 2012 when the opportunity arose. “Allowances claimed by the Taoiseach strictly adhere and are fully compliant with the rules and guidelines laid down by the Houses of the Oireachtas,” they siad. A spokesperson for Quinn, meanwhile, said the education minister had chosen to pursue the unvouched model as it was “more appropriate to his needs”, and insisted that claiming such allowances was something “every member of the Oireachtas is entitled to do”. Records published this week show that Quinn returned €13,838 of parliamentary allowances paid to him last year – around 79 per cent of the total amount he was paid, more than any other TD. Ministers and junior ministers are not entitled to the same category of allowances as backbench TDs; while others are entitled to payments of up to €5,000 per month, depending on their commuting distance to Dublin, ministers are paid lower flat-rate allowances. Ministers opting to claim vouched expenses are entitled to €1,000 per month, while those who opt for the vouched system receive €1,666.67 per month. Politicians who receive unvouched allowances are only required to certify that the funds they receive are used for the correct purposes – which also include distributing newsletters, office rental, and advertising their services – but are not subject to audit unless they seek reimbursement for amounts beyond the recommended limit. This means that ministers choosing the unvouched model – whose telephone and travel expenses are already covered by their government departments, and who can use prepaid Oireachtas envelopes to distribute newsletters – are essentially beyond investigation as to how they spend the money. Kenny is the only one of 14 sitting ministers or junior ministers who were accepting allowances under the unvouched model last year, but who has switched to the vouched one for 2012. Quinn is the only minister to have gone the other way, switching from the vouched to unvouched systems. His parliamentary allowances are administered separately to his ministerial mileage claims, which have been called into question in recent months. Other cabinet ministers who claim unvouched parliamentary expenses include Richard Bruton, Joan Burton, Jimmy Deenihan, Brendan Howlin, Michael Noonan, Pat Rabbitte and Alan Shatter. The Oireachtas published reconciled accounts containing details of returned allowances earlier this week – revealing that 57 TDs, including Quinn, had given back some of their unused allowances for 2011. Email “Taoiseach makes switch to vouched expenses – costing us extra €8k this year”. 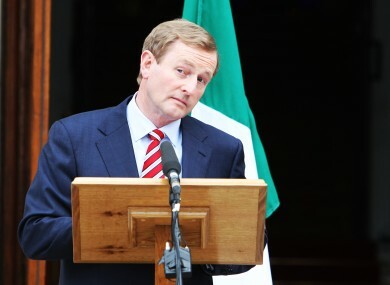 Feedback on “Taoiseach makes switch to vouched expenses – costing us extra €8k this year”.